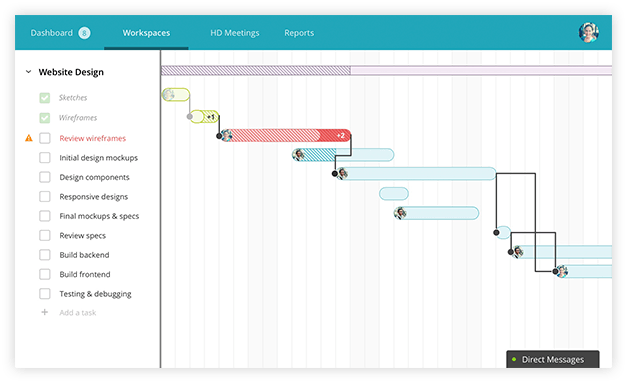 Timeline view is Redbooth’s native, completely automated Gantt chart creator. If you’re still building Gantt charts by hand in Excel or Google Sheets, you’ll love Redbooth's single-click Gantt charts. Just add your tasks, along with start and end dates — then click a single button! It's a simple process that everyone on your team can pick up right away. Forget about updating multicolored boxes in your spreadsheet! Changes you make to your tasks in Redbooth are automatically applied to your Gantt chart. Discover the power of Redbooth’s Timeline view. Leave spreadsheets behind and see why thousands of companies are using Redbooth for Gantt chart project management.